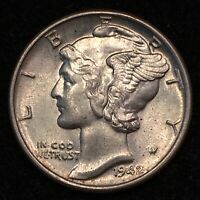 1917-D Mercury Dime PCGS MS 65 ** Tough This Nice, Better Date, Rainbow Toner! 1928-S MS66 Mercury Dime 10c, PCGS Graded, Colorfully Toned! 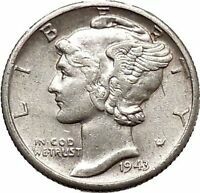 The Mercury Dime (Winged Liberty) was minted from 1916 to 1945. It is getting more and more difficult to get brilliant coins like these at low prices. With the few coins that exist in this high quality, along with climbing silver prices, now is the time to collect these gems. Right now, they are available at great prices and in beautiful condition. I am taking the opportunity to show my grandchildren (7 and 9) that there has been a change in the minting of coins. They been actually taken back by what coins looked like in earlier years compared to now. I am so glad to find something to introduce these youngster into something new. 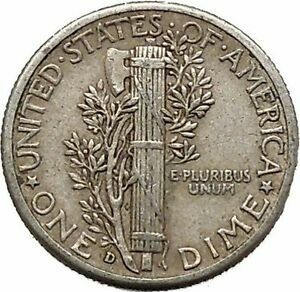 Review of this Mercury Dime. Sorry I could not get the yes button to click everywhere but all 3 are a yes! 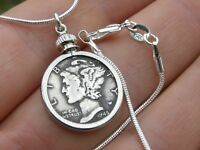 This is a beautiful Mercury dime. I plan to make cufflinks out of the 2 Mercury dimes that I purchased from the Seller. They will remind me of my mother. My sister did not want to give them to me so I am making my own! Beautiful quality, and very very clean. A bit over rated slabed at VF25, was a Philly strike so easer to ID as a '42/41. Auction price is not controlled so if high it's the buyers pick !! still a nice coin. These dimes where in very good shape, with the dollar as chaotic as it is I like these mercury dimes for a hedge against the dollar, it takes 12 to make a ounce of silver which will rise in value again so they are a great investment.